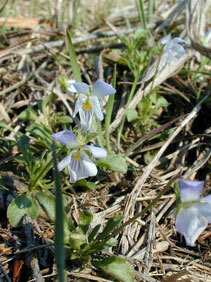 Also Called: Wild pansy, field pansy. Stems: Erect or often branched from bases and above, slender, glabrous or sometimes short hairy. Leaves: Alternate, simple, stalked, egg-shaped or circular to spatulate, 1/4 to 1 inch long, 1/4 to 1/2 inch wide; margins shallowly toothed to nearly entire; tips rounded; stipules large, palmately lobed, leaf-like. Inflorescences: Solitary flowers in leaf axils, stalks 1/2 to 1 inch long. Flowers: Small; sepals 5, oblong-lanceolate, margins fringed with hairs, tips pointed; petals 5, bluish white or blue, darkly veined, 2 lateral petals bearded, lowest petal yellow toward base, short-spurred; stamens 5. Fruits: Capsules, oblong, yellowish; seeds tiny, numerous, smooth, yellowish. Habitat: Prairies, pastures, open woodlands, roadsides, and waste areas, most abundant on sandy soils. Uses: Native Americans used Johnny-jump-up to treat colds, coughs, and headaches. Comments: Johnny-jump-up spreads by seed and appears in patches or colonies. The name refers to the plant's quick growth in the spring, i.e. it "jumps-up".